FC Tertons is through to the next stage of qualifying for the 2017 Asian Football Confederation Cup. In their last match of the play-off qualifiers yesterday, they defeated Sheikh Russel Krira Chakra of Bangladesh. FC Tertons displayed an impressive first half. 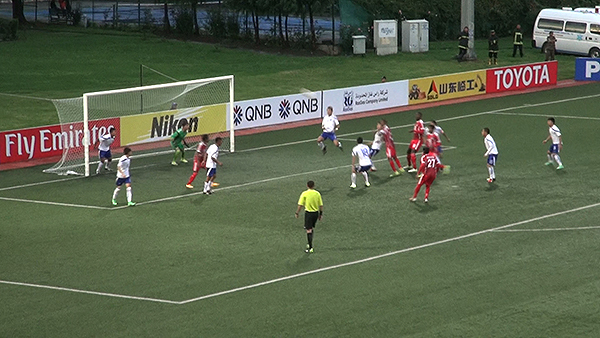 After18 minutes into the game, forward Chencho Gyeltshen gave his team the lead only to be equalised by the Bangladeshi club two minutes later. FC Tertons restored their advantage a few minutes later. It was followed by two more goals. The first half ended with Sheikh Russel Krira Chakra trailing behind by three goals. The second half began with the visitors more determined to narrow down the gap. Few minutes into the second half, FC Tertons conceded a penalty. But, Bhutan’s goal keeper Hari Gurung rose to the occasion and made a crucial save. Sheikh Russel Krira Chakra continued chasing the game and managed to score two more goals in 66th and 70th minute. But FC Tertons held onto the slender lead and their ticket to the next round. “I think they were bit relaxed after scoring four goals in the first half and the opponent scored two quick goals in the second half. I don’t want to blame my defence because that is the opponent’s strategy,” said FC Tertons Coach, Passang Tshering. The match ended with a score of 4-3. Asian Football Confederation is yet to draw the fixture for the next round of 2017 AFC Cup.